This is the future! And you can get started today! Description: Virtual Reality gives students an immersive experience, and immersive experiences are more memorable. Imagine how memorable faith lessons can be! It’s not merely a lesson for the mind. It’s an experience of the heart. Virtual Reality is a fast-growing field of communication that is soon going to gain popularity in widespread uses. The benefits for faith formation come from what happens when people feel immersed in what they are studying. This is the most immersive learning tool of our lifetime. 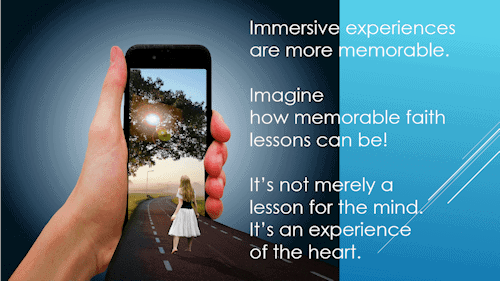 Workshop: Catechists can use Virtual Reality to give their students faith-based lessons that they will never forget by assigning projects that use a smart phone, a free app, and a free place to host their 360 photos. 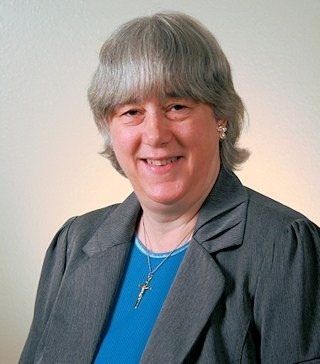 Terry Modica, director of the technologically creative Good News Ministries of gnm.org has been pioneering the use of digital technology for evangelization since 1996. In her live workshop, she explains the newest improvements in VR for the classroom and demonstrates everything in simple terms, including where the VR projects can be hosted online for free. You will start with your own project right there in the workshop! Interested in having this workshop for catechists in your parish or diocese? 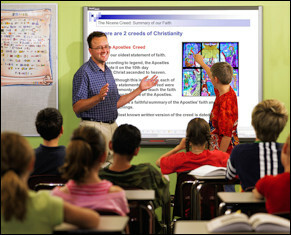 Terry also gives this to Catholic School teachers for use in almost any subject being taught. Contact her at gnm.org/events-inquire/. 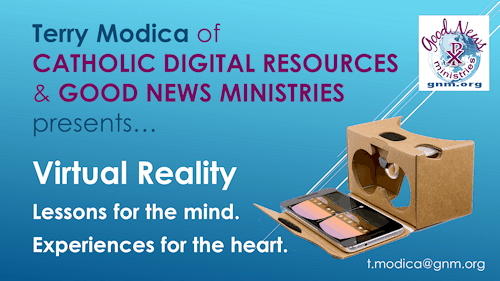 Download the Presentation: You may download the PowerPoint presentation Terry Modica uses in her annual workshop at the Mid-Atlantic Congress, Archdiocese of Baltimore, about “How to Use Virtual Reality in the Classroom to Inspire Faith“. It’s Easy: Everyone with a smart phone and a free app from Google can make a 360 VR experience. VR popularity is quickly growing. Learn how to assign VR projects that are immersive experiences of faith-based lessons, which your children or teens will never forget. Subscribe to Terry’s blog about using VR for faith formation: catholicvr.net/category/our-vr-experiences-to-enjoy/. *Those who have attended Terry’s workshop may use the coupon code she provided to download this PPT presentation free. To use the coupon code, place the order. In the shopping cart, enter the coupon code in the appropriate box and click “apply”. This zeroes the cost. Proceed to place the order. Once completed, you will receive a download link on screen and by email.